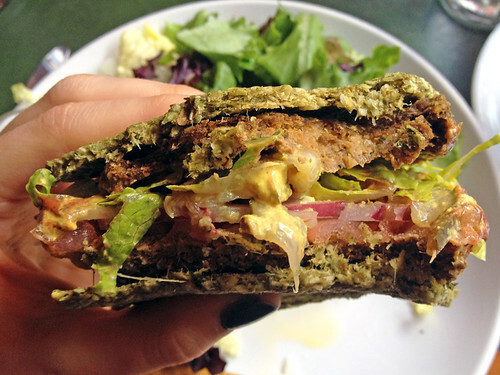 It’s been too long since I reviewed a raw, gluten-free burger, hasn’t it? So I took my sister out to lunch at Quintessence the other day. 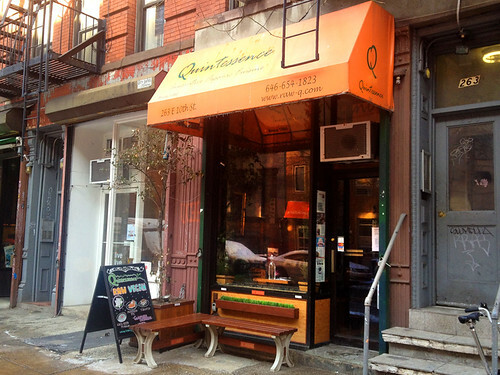 This restaurant is so cozy, tucked into a cute little space in the East Village. 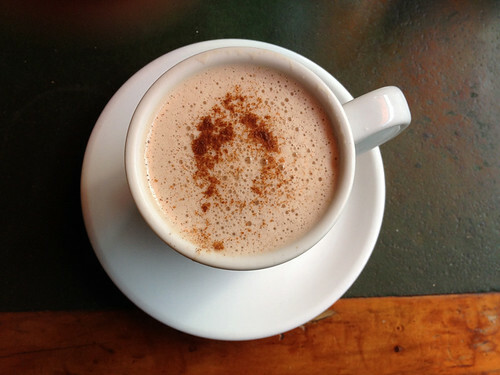 I ordered a cashew milk chai latte while I waited for my sister to arrive. It was delicious. Although everything on the menu sounded amazing, I kept my eyes on the target: The All American Burger with BBQ Sauce. 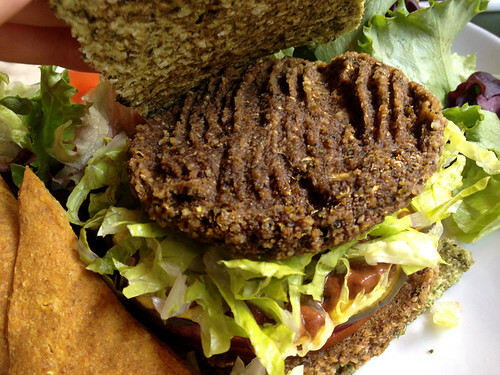 Quintessence offers a choice of three types of raw bread for their sandwiches and burgers: kamut bread, squash coco-chia bread, or veggie bread. Kamut is a type of wheat, so that one is not gluten-free, but the other two are. My sister ordered her club sandwich on the squash coco-chia bread and I ordered my burger on the veggie bread. They looked very similar, just a slight difference in coloring. My veggie bread tasted fresh and healthy, like a salad. It was thin and soft, but held the burger together surprisingly well. The only negative was that the texture was a bit weird to me – I couldn’t help but think that it reminded me of an old sponge. I imagine it’s an acquired taste, and I have to admit I don’t eat raw food very often. The toppings were awesome – I don’t think I have had a raw burger before that packed this much of a flavor-punch! Lettuce, tomato, onions, and deliciously tangy pickles (home-made!). And the barbecue sauce – wow, I wasn’t expecting something so yummy, and I was kind of blown away by it. This burger actually comes with not one but two patties – with all those tasty toppings sandwiched inbetween. They had a nice earthy, spicy flavor – actually a very strong spice, I noticed when I broke off a piece of a patty to try on its own without bun or toppings. They were a bit dry, but that was balanced out by the juicy toppings and the barbecue sauce. At $19, this is quite a splurge for a veggie burger. 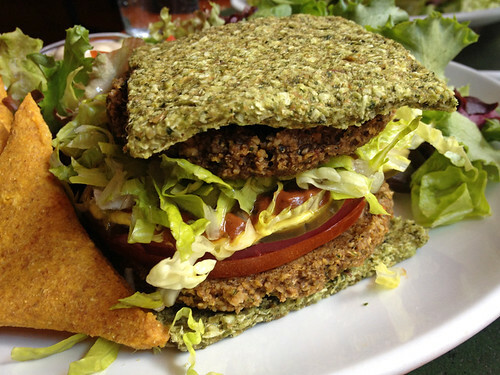 But if you want to treat yourself to something extra-healthy and tasty, I have to say this is the best raw veggie burger I have tried thus far! My sister reports that she enjoyed her club sandwich as well. I LOVE quintessence!! Lovelovelovelove the place..... The tacos are amazing, the "peter's pot" soup is great, and their chia pudding dessert is unreal- i've gone and just ordered the chia pudding (its huge!) and a cashew milk latte for brunch. So good.